As veteran readers know, I am a big fan of Eurostat's EU-SILC survey, the source of all European poverty statistics, among other things. I'm always amazed at how poorly the figures are reported on, with the juiciest ones typically buried under the headline-grabbing 'living in poverty' and 'at risk of poverty' statistics. I reviewed these figures a year ago, when the latest update dated back to 2011; you can see that analysis here. 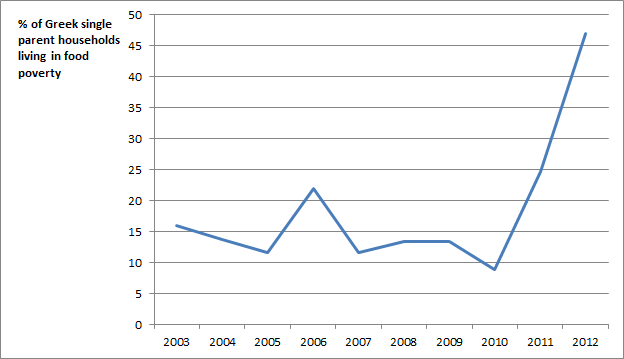 But now the 2012 figures are in and the results are staggering. Following last year's methodology, I have condensed them into three tables. The first table refers to food poverty, defined here as the inability to afford meat, fish or pulses every other day. Full data here. People (especially men) living on their own did best in this regard during 2012, but were the only type of household to report reduced rates of food poverty. Presumably, this reflects the trend for young people who previously lived alone to move back into the family home. Everyone who was still living on their own by 2012 is by definition likely to be better off. What is much more notable is the absolute explosion in food poverty among single parents, nearly half of whom were unable to feed properly. 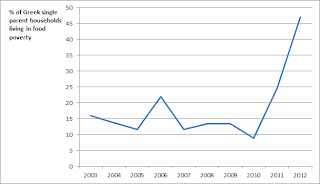 The rate doubled year-on-year in 2012 alone. Overall, 17.5% of Greek households with dependent children weren't feeding properly, which is comparable with the rate in Italy and still below the rates seen in accession countries. 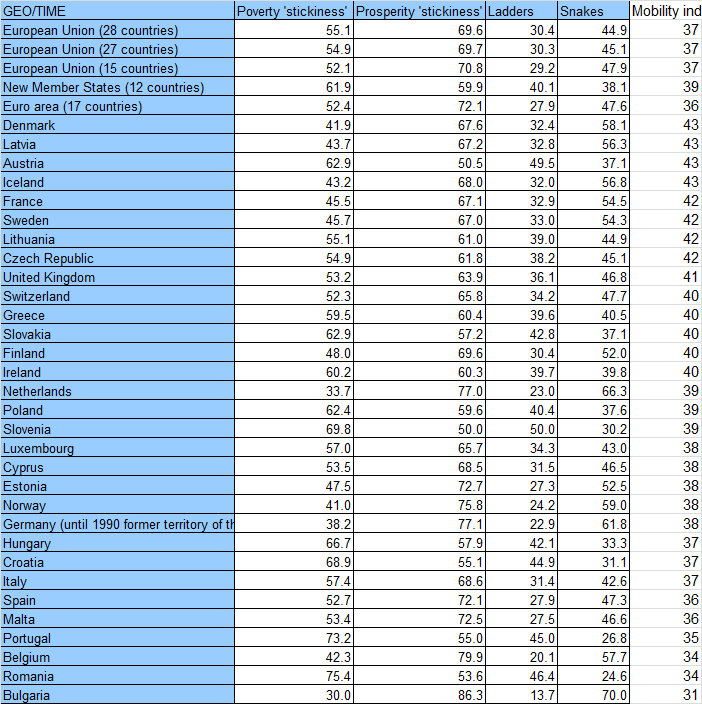 But among single parents, only Bulgaria does worse than Greece, and that by a small margin. The second table refers to an approximation of fuel poverty, namely the inability to keep one's house adequately warm. Full data here. Whatever the dangerous wood-burning of the last years may suggest, fuel poverty didn't jump quite as fast as food poverty, but it did jump across all types of households. Worst-affected were households with more than two adults but no children - which I suspect means young adults staying with their parents. 24.3% of households with children are fuel-poor, a figure surpassed only in Cyprus and Bulgaria. The pattern is similar for other types of households, including the particularly hard-hit multi-adult households. The third table refers to arrears - accumulating debts due to rent, loans, consumer credit or unpaid bills. Full data here. Here the figures have been less volatile year on year, but 2012 was still the worst year on record, with 39% of households having arrears of one kind or another. Arrears increased across all household types, apart from single men, but single parents were worst hit, with 58% of them now in arrears. As a rule almost all types of households with dependent children accumulated disproportionate levels of arrears in 2012. 46.3% of all households with dependent children were in arrears, the highest figure in Europe and its periphery countries, bar none. More data are also available on households' ability to deal with unexpected expenses (full data here) and their self-assessed ability to 'make ends meet' (full data here). The results on unexpected expenses are interesting because they demonstrate the trade-off presented by greater access to consumer credit. Greek households are better placed even now to deal with unexpected expenses than they were back in 2003, when Greece wasn't in the depths of a decade-long depression. However, this is mostly due to self-restraint (households with dependent children, which do not have the same level of discretion over their spending, are genuinely worse off in this respect than in 2003), and of course comes at the price of mounting arrears. Regarding inability to make ends meet, it's worth noting that 70.1% of single-parent households face this problem, more than double the 2008 figure. Whilst we're on the subject of poverty, though, Eurostat also published an even less media-friendly study into poverty, which looked at the extent to which it persists between generations - i.e. to what extent the children of poor people tend to be poor and those of the well-off tend to be well-off. You can check the figures for yourselves here, but to me what stands out is the following. As of 2011, poverty and financial security were equally 'sticky.' 59.5% of those Greeks who were having trouble making ends meet in 2011 grew up in households that had similar problems. 60.4% of those Greeks who were not having trouble making ends meet in 2011 grew up in households that also hadn't had such problems. The level of 'stickiness' of poverty was quite high by European standards (59.5% v. 52.1% in the EU-15), but the level of 'stickiness' of prosperity was low (60.4% v. 70.8% in the EU-15). This suggests that, over the lifetime of the average citizen, and compared to its EU peers, Greece has been relatively good at keeping poor people poor but not at keeping comfortable people comfortable. Looking at the other two quadrants, it's possible to benchmark the snakes and ladders of social mobility across Europe. The 'snakes' figure is the percentage of today's struggling people who came from comfortable backgrounds. At 40.5%, it's relatively low in Greece, compared to the 47.9% average in EU-15 countries. The 'ladders' figure is the percentage of today's comfortable people who came from struggling backgrounds. Greece's 39.6% compares favourably to the EU-15's 29.2%. Presumably the desirable kind of mobility is for people to climb out of poverty and for poverty to become less 'sticky.' 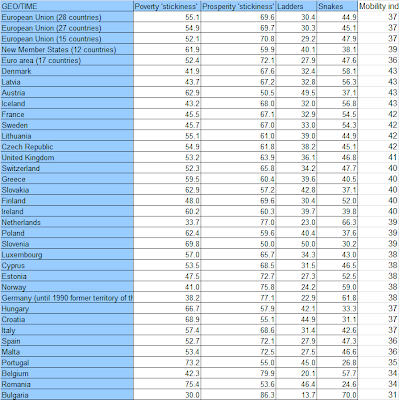 If so, a simple composite index of 'mobility' based on these figures would crown Denmark, Austria and Iceland the winners (I'm excluding Latvia where mass emigration has introduced a kind of 'survivor bias' in favour of mobility). Bulgaria, Romania and Belgium would find themselves trailing. Greece would be quite close to the top, actually. The reason? The period through which 'mobility' is examined is, by the very nature of the questions, very long - equal to the average person's lifetime. The median age in Greece was 42 in 2011, so we're essentially looking at 1969 to 2011.